With Buffalo fielding a football team for the first time in over ten years in the Fall of 1915, the school administration decided that basketball should also officially return as a varsity sport. Incredibly, Powell was the head coach of both the University of Buffalo AND the University of Rochester varsity basketball teams during the 1915-1916 and 1916-1917 seasons. At the time, coaching jobs were part-time contract positions and Powell took any assignment he could get. After the 1917 season, Powell severed his relations with the University of Rochester and devoted his time to the U.B. basketball. He spent the next 27 years as the head coach of the U.B. basketball program from 1915 to 1943. Powell also coached the U.B. football team from 1916-1921. Not having a gymnasium anywhere on campus, the team was forced to practice in the gymnasium of the Buffalo Turn Verein, a social/cultural club located at 385-387 Ellicott St., Buffalo. Most home games were played at Orioles Hall, 566 Genesee St, Buffalo, NY. The hall was built in 1914 for the Fraternal Order of Orioles, a social and charitable organization, by prominent Buffalo business leaders of German descent. The building still stands today. When his career ended, Art Powell had coach men’s basketball for 38+ seasons at the University of Rochester, University of Indiana, University of Buffalo and Canisius College. He died in Kenmore, NY at the age of 85 in 1969. In 1984, he was inducted into the University at Buffalo Athletics Hall of Fame. 1 – “U.B. Could Not Hold Lead in Second Period” Buffalo Evening News, Buffalo, NY, 15 January 1916. 2 – “U.B. Falls to Duquesne Five in Scrappy Contest” Buffalo Courier, Buffalo, NY, 16 January 1916. 3 – “U.B. Did Not Play at Geneva Last Night” Buffalo Evening News, Buffalo, NY, 18 January 1916. 4 – “U. B. Boys Lost to Falls Collegians” Buffalo Courier, Buffalo, NY, 30 January 1916. 5 – “U.B. Teams Beats Carnegie on Court” Buffalo Courier, Buffalo, NY, 20 February 1916. 6 – “U.B. Overwhelms Hobart College on Court, 57-17” Buffalo Courier, Buffalo, NY, 27 February 1916. 7 – “St. Bona Five is Easy For U.B. Team” Buffalo Courier, Buffalo, NY, 5 March 1916. 8 – “U.B. Hands Another Defeat to Hobart Five” Buffalo Evening News, Buffalo, NY, 13 March 1916. 9 – “Capt. Burns Saves Game For U.B. 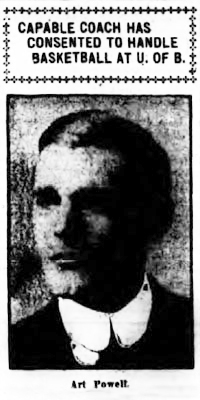 in Canisius Battle” Buffalo Courier, Buffalo, NY, 26 March 1916. 10 – “Canisius Beaten By U.B. For Title” Buffalo Courier, Buffalo, NY, 4 April 1916. Manager Tommy Atkins of the University of Buffalo basketball team announced yesterday the appointment of Art Powell, the diminutive former star of Syracuse, as coach of the local seminary’s quintet of basket shooters. Incidentally the schedule for the season was made public and the names of several men, who are fighting; for positions on the local aggregation. Taking everything, including Art Powell, the candidates for positions on the five and the schedule arranged for the season, into consideration it looks as though the University of Buffalo will get recognition before the year has progressed very far. Powell up to last year was coach of the University of Rochester basketball team. The Dead City teams beat the best of them under his tutelage. There is daily practice in the Turn Verein hall, which is not far from the university in High street. If the material, which has turned out during the past few days, is any criterion, the local quintet will be an all-star aggregation. Among the candidates are three members of last year’s victorious Canisius team, which nearly completed the season without a defeat. They are Lyons, McMullen and Cotter. Other candidates are: Burns, University of Pennsylvania; Lavin, Rochester; Cooper, Auburn High school; Bates, State college, Albany; Smith, Cornell freshmen; Drexilius, St. Joseph’s; Siegel, Hutchinson H.S. ; McGill, Olean High school; Hayes, Tonawanda; Ryan, Syracuse H. S.; Burns, Albany; Eastman, Hamburg; Lawrence, South Carolina; Kerns, Olean H.S. ; Ripley, Syracuse; Merchant, Ravena H. S.; Stowell, Waterman, Patterson, Manchester, Jones, Dobson, Scott. Local Varsity Boys Playing Strong Teams Capture Majority of Games Played. Winning seven out of 11 games is the record of the University of Buffalo basketball team for the 1915-16 season. The local collegians hold victories over Hobart, Carnegie Tech, St Bonaventure, Clarkson Tech and Canisius College, having defeated Hobart and Canisius on two occasions. Their losses were the Carnegie Tech, Duquesne, Niagara Falls and St. Lawrence. The local intercollegiate basketball champions brought their season to a most successful close with the victories over Canisius. The team was off to a very weak start, losing its first four games but after a few weeks of practice under the teachings of Art Powell showed the class of the big college teams.